Hello everybody, I am new here and new to owning a fibreglass RV. I recently purchased a Trillium 1300 from a previous member here, Thinh. While he had done a lot of work on the trailer, I knew when I bought it that I would need to do a lot of work sealing it up from leaks. Right now I am in the process of removing windows and re-sealing them. I will also have to do the door hinges. I have the back window and the curb side back window off so far. Both showed signs of water infiltration and some wood rot. My question is, how clean of old silicone and butyl tape do I need to get the surface before replacing the windows? It is clear to me that the PO painted over the previous PO’s silicone, so in trying to remove it, i am removing paint. It’s unfortunate, but I knew that I wanted to paint the trailer eventually (I wasn’t planning on doing it this summer though). Is it ridiculous to paint it later with the windows in? Another thing i was wondering about is the slope of the kitchenette. I am going to post a picture below. Is it supposed to be this sloped? Do i need to support it and brace it so it is less slanted? I know that the PO fixed some rotten plywood under the fridge, but I am unsure it this would create this issue. Would this also affect the fibreglass on the roof? THere is no cracks, but I can see some spider cracking in the front driver side corner (pic below). Lastly, what’s the best way to remove sticky glue from ensolite? Ok, I am going to try to keep you all posted with my progress. Wish me luck - I will need it if I am going to try to get all of this silicone off of the window perimeter. Why are the pictures sideways? I didn’t take them sideways. You need to open the sideways pix in a photo processing program and rotate them, before posting. Or, you can shoot all the pix in landscape orientation. That kitchenette sag is not normal. No wonder! That upper cabinet was not designed to support a microwave oven. OUCH! On the windows, I used barkeepers friend and a green scrub pad to clean the residual off. I carefully removed all I could first with a plastic scraper first. I had no plans to keep the microwave anyway. Doesn't really interest me to have one while camping. Do you think that would fix things? The best way to look at it is that unsupported microwave has damaged the fiberglass structure. Removing it now is not going to fix it, the damage is done. I would pull that microwave for sure to keep from doing more damage. I would buy some type of support, Scamp sells one, or make a chrome pole or whatever. I'd consider it damaged now. So moving it back to its original position may put even more stress on the fiberglass. So its going to take care and caution to correct it. It appears that (1) the upper cupboard is sagging, and (2) the base cabinet is slanted up. To fix problem (1), as thrifty bill said, insert a support. Actually I have found in my Boler 17 that this can be very effective. Best to raise it a little at a time. As far as problem (2) (base cabinet slanting up toward the aisle), that's a tough one. Is it possible the PO inserted a too thick layer of new plywood underneath? Regarding the removal of caulk, etc around the windows, its not extremely critical to remove all crud before applying new butyl tape and re-installing windows. I did actually clean down to bare gelcoat, then wipe with acetone or isopropyl alcohol before re-installing windows. My thought was strip and clean it now or do it later, and more work to do it later. Regarding question about painting, one option is to buy matching paint and just touch it up now. Then totally re-paint later, and decide at that time whether you are going to remove everything. Thanks a lot, I agree that the base is slanted, but I'm uncertain as to whether or not its something to worry about. I'll take the microwave off for sure though. Bill - can you tell me what you mean about the fiberglass being damaged? I don't see any cracks or anything, do you mean that it's permanently warped? Warped I can handle, but "damaged" seems like more of a concern. Do I still need to worry if there is not cracks? As I said, I'm a total newbie at this stuff, so i'll take whatever info I can get. As much as I'd love to have a pristine, new-looking Trillium, I'm also pretty satisfied with totally usable, looks alright, and will last me a long time as is. 1-Is the underbelly of the trailer still sealed Fiberglass or is there a cut somewhere near the Kitchen Cabinet area outside under the trailer? 2-What is the exposed surface of the floor inside the trailer made of? Is it wood or fiberglass and can you tell if that Kitchen cabinet is fiberglassed to the side wall at the bottom or the floor along the front edge? If I remember correctly the floor in there should be a Fiberglass/wood/Fiberglass sandwich and that cabinet should be sitting on top of the sandwich and riveted to it along the front bottom edge somewhere or fiberglassed to it along that seam. It sort of looks to me as though that whole cabinet which was originally attached to fiberglas on its entire perimeter has been disconnected from that attachment which has allowed the counter and base to angle up and the upper cabinet to sag down? I have a feeling that unless the original attachment is restored somehow that neither will really be right again as the cabinet is sort or cribbed onto the whole shell of the trailer from the factory making both the shell and cabinet structural and they need each other for both to be right. Does any of this description make sense to you looking at these things? 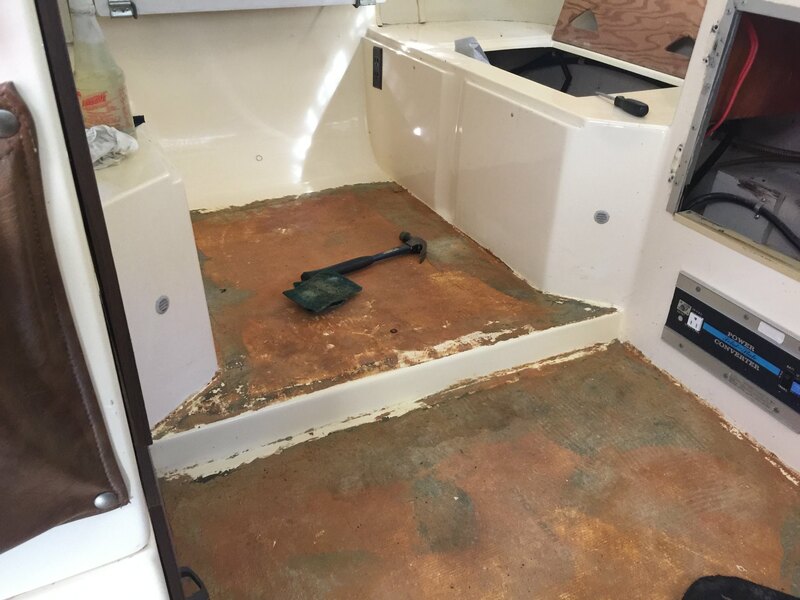 Can you post pics of the floor/cabinet junction and see from inside the cabinet and seat bases if the cabinet is still attached to the trailer walls? That side wall above the stove and sink is actually a double wall with the outside wall being one wall and the cabinet back between the upper and lower the inside wall,if you look inside the upper cabinet you should be able to see what I mean if they are still connected. Also the entire cabinet structure should be a single formed piece which forms the inside cabinet back wall. I think if the cabinet is not still connected to the trailer and in one piece then merely installing a brace will not do much good until the underlying issue is fixed. So what I am really wondering is exactly how the floor under the fridge was repaired and if this maybe is causing all of your issues in this area? 1. The under belly is a continuous piece of fiberglass, from the belly band down. Cabinets inside the Trillium are separate pieces of fiberglass, that are then fiberglassed in place. The floor is covered with fiberglass as well, but you will see the plywood extending past the floor under cabinets. 2. I believe the kitchen unit is fiberglassed in on all four sides. I'll wait for others to chime in. 3. No rivets. Cabinets are fiberglassed into place. It makes for a very attractive trailer IMHO, but also makes some repairs much, much harder. To get to the area inside a Casita dinette bench, you just remove a few rivets. To get inside the bench on the Trillium, you have to be a contortionist, and just about stand on your head. Example, I found replacing and rewiring the tail lights and rearward side marker lights to be challenging. You can see how the floor meets the cabinets if you look carefully on my floor cleanup. Residual glue from the carpet is on the fiberglass floor. This is exactly what I was trying to describe. I have seen them both virgin as yours appears and also riveted into place after the fairly common floor repairs in that area which is why I described it like I did. I have seen them where the floor in front of the cabinet was cut to gain access to the plywood for repair/replacement and then rivets or screws used to reattach the cabinet base there. I have also seen the trailer with the Kitchen cabinet as a separate part distinct from the benches unlike how it appears on yours? What year is this one Bill? It sure does make for a slick interior but I think you can imagine that if this integrity between the shell and the cabinet is broken and not repaired adequately that the op's pic of the trailer in question is a likely or possible result? So it has been a long time since I had one of these but this is just how I remembered mine and your pic makes it come to life for the OP better than I could hopefully. You can see too how merely bracing the upper is hardly a complete fix if this cabinet is not attached like it should be as well. I'm not doing anything on it until monday, but in the meantime, this is a previous post from the PO. Not sure if its helpful or not. I don't find it helpful at this point, but you might. Loose frame bolts and deterioration of floor. If it's fiberglassed to the wall, it doesn't make sense to me that it could come loose, but I'm seriously green at all of this. I guess I could take out the fridge, but the sink side of the kitchenette is over the wheel and wouldn't be supported by the same piece would it? Thanks for weighing in on this so far. As I've said, I'm just looking for a functional, useable trailer, that's not going to leak, and will last. Whatever I've got to do to achieve that, I will do my best. Slants and dips I can deal with, but structural issues are whole other matter. Mine is a 1977. Yes, the benches look integral to the kitchen cabinet, you can see the pass through. But I can't image them being one piece, as it would have made building the trailer very difficult. I guess they did a great job fiberglassing them together. I don't see it coming loose. I see it causing a big dip in the roof, that could eventually cause roof damage. The upper cabinets were never designed for that hanging weight. Dump the microwave, slowly jack up that upper cabinet, add supports at either end, and enjoy. I used acetone/green scrub pad, along with bar keepers friend (separately, not at the same time) to clean up the gunk around the windows. Two layers of butyl tape, 1 inch SS screws, replaced rotten wood, and I was done. Where the wood was not rotted, but the screw holes had some issues, I used hot melt adhesive and toothpick pieces to tighten them up. Body to frame screws 99% chance they are toast unless someone replaced them already. Picture that microwave, while the trailer is bouncing down the road. That microwave is going to torque that upper cabinet and roof every bounce. Not good. At some point, I would think it would crack the roof. Immediate removal and maybe you are OK! I believe the kitchen section was molded as one piece, from the floor to the ceiling, and then fiberglassed into the trailer. Assume all interior cabinetry have a dual purpose: use as cabinets and structural support of walls and roof. That microwave has been pulling down the roof. Looks like it has the side wall leaning in too. Notice the ensolite on the ceiling is all bunched up in front of the upper cabinet? That is a possible sign of a leak. Or something is going on. You have my favorite Trillium 1300 layout with the front dinette. Wish I had that! David Tilston and Randy Bishop are the two Trillium experts here. Both own several and have refurbished many of them. There are several others that have done wonderful jobs refurbishing their trailers as well. I'm new to the Trillium world. I have also had a refurbed a few of these which is how I know what I am offering here in the first place. What I will try to tell you one more time is that I have seen a few where that cabinet has been detached from the trailer to repair the floor. I would not do it that way but others have and unless repaired to a decent standard that will also cause the folding of that side of the rig that the one sideways pic seems to show to me. I also agree the Microwave is a terrible idea to have hung there. Many of these also have sagging roofs all on their own and part of my renovations is always to add shelving above the windows with support jacks to the roof vent area to lift the roof back into better position too. Anyway without better pics of the issue it is impossible to really know what the trouble is so I am butting out of this pending better pics.